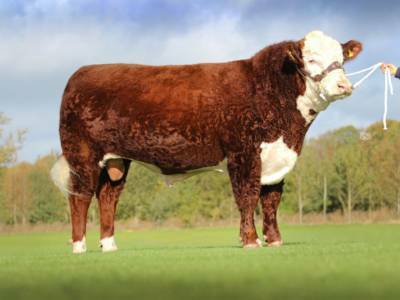 A beef cattle breed originating from Herefordshire but now there are more than five million pedigree Herefords in over 50 countries. Famed for its white face, crest, dewlap, and underline the Hereford breed has enjoyed something of a renaissance in recent times due to its ability to produce quality beef from grass without the need for concentrates. Herefords often have short thick horns that typically curve down at the sides of the head, but both Polled and Horned strains are still bred. Modern Hereford cows stand around 140cm at the shoulder and weigh 600-800kg while bulls average around 152cm and 1000-1200kg.